Red and infrared are a perfect combination to treat alopecia, real results are noticeable on hair growth. Low-frequency laser therapy uses cold red light. The light from the LEDs penetrates the surface of the skin without creating heat, causing no damage or side effects to the skin. This light is converted into chemical energy that promotes hair renewal. Specifically designed to promote hair growth in men and women suffering from androgenic alopecia (hair loss and weakening of the hair fibre). The LEDs use an exclusive non-invasive technology, no risk of burns. 1 – Study conducted by Kim H, Choi JW, Kim JY, Shin JW, Lee SJ, Huh CH. 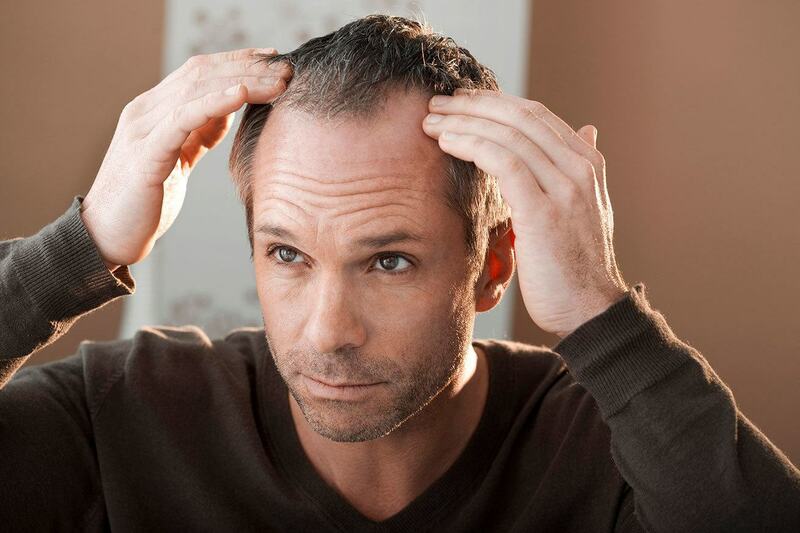 Background: Androgenetic alopecia (AGA) is a common disorder affecting both men and women. Finasteride and minoxidil are well known and effective treatment methods, but patients with poor response to these methods do not have additional adequate treatment modalities. Objective: To evaluate the efficacy and safety of a low-level light therapy device (LLLT or photomodulation led) for the treatment of AGAs. Method: The study was conducted for 24 weeks, randomized, double-blind and also controlled with a dummy device. Forty subjects at the AGM were recruited and scheduled to receive treatment with a headset with 630, 650 and 660 nm domestic LLLT emission device wavelengths or a dummy device for 18 minutes every day. Evaluation carried out under phototrichogram (hair density and thickness) and an overall assessment of hair growth. Result: After 24 weeks of treatment, the LLLT device significantly increased hair density compared to the group of trompe-l’oeil devices. The mean hair diameter improved statistically significantly more in the LLLT group than in the dummy group. This overall assessment showed a significant difference between the two groups. No serious adverse reactions were detected. Conclusion: Photomodulation or LLLT could be an effective treatment for AGMs. Background: Alopecia refers to the acceleration of hair loss in one or more areas, most often on the scalp, affecting both men and women. It is an autoimmune disease that is treated with different techniques and with more or less satisfactory results. Laser treatment of different wavelengths has been used in the treatment of alopecia. Objective: To study the effect of the pulsed infrared laser diode (904 nm) in the treatment of alopecia. Method: Sixteen patients with 34 resistant areas who had not responded to different alopecia treatment techniques. In patients with multiple zones, one zone was left neutral for comparison. Patients were treated on a 4-session basis, once a week, with a pulsed laser diode (904 nm) at a pulse rate of 40/sec. A photograph of each patient was taken before and after the treatment. Results: The patients treated were 11 males (68.75%) and 5 females (31.35%). Their ages ranged from 40 to 50 years. Hair growth was observed in 32 areas (94%), while only 2 areas (6%) showed no response. No hair growth was observed in the control areas. In patients who showed results, results were seen in the first week after the first session for 24 zones (75%), while 8 patients (25%) began to show results in the second session. Conclusion: The pulsed infrared laser diode is an effective technique for the treatment of alopecia with a high success rate on resistant areas of alopecia. By improving the oxygenation of the bulb and the metabolism of its cells, sebum secretion (in the case of hyperseborrhoea) is normalized, hair loss and quality is enhanced. LED is effective in this indication by itself and will potentiate the action of dietary supplements, mesotherapy treatments (vitamins + hyaluronic acid) or PRP anti-fall or micrografting.